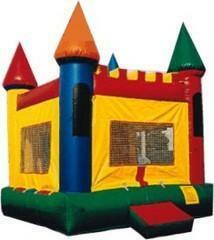 CASTLE BOUNCE HOUSE Buy It today! Attendants: #1 required during operation. Initial training provided online with certification for successful completion..
An awesome children's party idea that fits many childhood and family themes! Medieval damsels, and castle guards will play in your Mighty Castle jump house for your Prince or Princess and their subjects to moonwalk, bounce and jump safely. 13 feet long, by 13 feet wide, by 16 feet tall. This inflatable is now on sale. It is still fully functional but no longer has the crisp clean look as the units we rent. Original price over . Now offered for sale. Comes with blower and online training program to operate unit. Will also include operations manual.